In the region of Achensee you will find a wide variety of family-friendly winter sports and leisure activities. 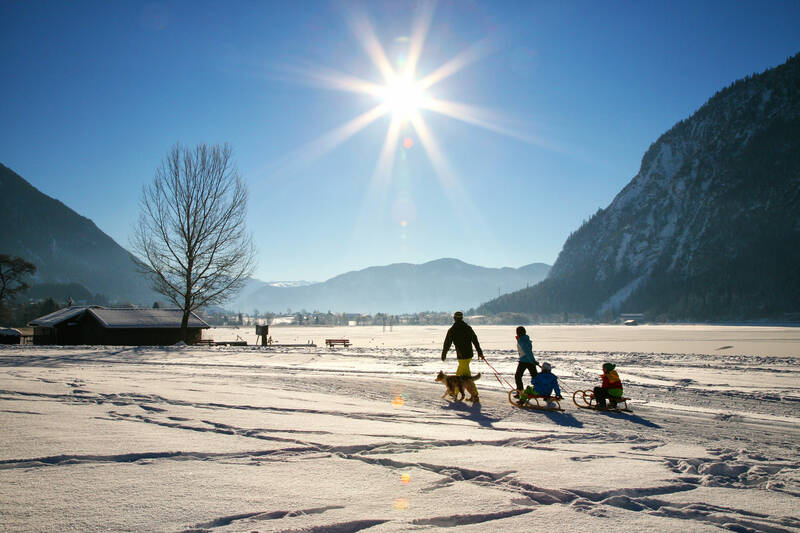 From children’s skiing lessons with Bobo the Penguin to snowtubing, action-packed tobogganing runs to leisurely cross country skiing tours, Tyrol’s “Sports and Vitality Park” in Achensee offers everything for a perfect family winter holiday. The Achensee region stands for high quality family holidays. It is one of the “Family Villages of Tyrol” certified by the “Association of Tyrolean Family Nests” for quality family holidays. Only Tyrolean regions with an above-average recreational offering suited for families may become members. In addition the infrastructure – including accommodation establishments – must be particularly geared towards children and younger guests. Thus your winter holiday in Tyrol is sure to be pleasant experience for your family. The family-friendly beginners’ skiing areas in the Achensee region are right at Hotel Pfandler’s doorstep. Those who want to learn how to ski have come to the right place. At Bobo Kid’s Club at Ski School Leithner, your children’s first experiences skiing will be fun as well as successful. The cable cars can be reached directly from the hotel as well. Paired with activities such as cross country skiing, tobogganing, snowtubing, winter hiking and snowshoeing, Tyrol’s mountain and (largest) lake region offers the best ingredients for a most exciting and varied family winter holiday. Ski School Leithner offers specially developed children's programmes that are tailored to the needs of the little ones. The ski instructors are not only trained to teach ski technique, but are also given educational training, so they know exactly how to make learning to ski easier for children. The ski school continuously offers classes and workshops that are suitable for all levels, from children to adults.